Powers/Abilities: Boomslang is an excellent hand-to-hand combatant. He throws snake-shaped sickles which he calls "serpent-rangs." (Captain America I#341/2) - Several of the others having infiltrated the Serpent Society's Citadel, Boomslang invaded the Citadel at Viper's command. (Captain America I#342) - With Rattler, Cobra, Anaconda, Black Racer, Rock Python, and Copperhead, Boomslang was set loading canisters of mutagenic toxins into Serpent Saucers (however, Boomslang was not told what the canisters contained). He, Copperhead, and Cobra then departed for Washington D.C. with a full load of toxins. (Captain America I#343) - In Washington D.C., Cobra, Boomslang, and Copperhead dumped toxins into the cities water supply. (Captain America I#344) - Cobra, Boomslang, and Copperhead returned to their Saucer through a D.C. rife with people mutating into snakes, only to find Diamondback and the Captain waiting for them. The Captain (Captain America) took down Boomslang with one shot from his shield. (Uncanny X-Men Annual#13) - Cobra accepted a commission from Ghaur (Deviant leader) and Llyra (Atlantean) to retrieve items of arcane mystic power; he split the Society into squads. Asp, Boomslang, and Puff Adder went to the Savage Land to retrieve a stone idol, but were interrupted by Wolverine and Dazzler (who had been switched into Diamondback's body but was still wearing her own costume). The trio retrieved the idol, but Wolverine ambushed them and took down Boomslang and Asp; the X-Men claimed the item and the serpents returned home. (Captain America I#367/2) - Boomslang was present at a noon meeting of the Society where Cobra announced that he felt that he'd been underperforming as their leader and now intended to correct that and lead them to new heights as King Cobra. (Captain America I#372) - Boomslang was laying on a roof across the street from Diamondback's apartment, observing her through binoculars. 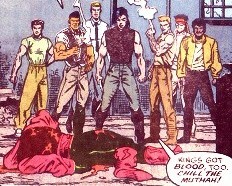 Captain America discovered him and he fled, only to be gunned down by seven gang members. Captain America saw him to a hospital, where he was given a 50/50 chance of survival. (Captain America I#411 - BTS) - Over time, Boomslang recovered. (Captain America I#411) - Boomslang was in the crowd at an AIM weapons expo on Boca Caliente where Crossbones fought five foes (Mad Dog and Ramrod came first) in a prearranged match. (Captain America I#412 - BTS) - Boomslang watched as Crossbones defeated Sumo, Razor-Fist, and Batroc before Zaran and Batroc announced that Crossbones was really Captain America and offered $50,000 to whomever took him down. 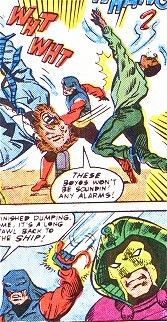 (Captain America I#413) - Boomslang was among the many villains who attacked Captain America en masse; the Captain eventually escaped. (Captain America: Sam Wilson#4) - Boomslang was at a meeting of Serpent Solutions, the rebranded Serpent Society, in a conference room with Captain America (Sam Wilson) as captive. Captain America, who had temporarily been turned into a wolf/human hybrid, had just been captured by Serpent Solutions members Black Racer, Copperhead, Cottonmouth and Diamondback. (Captain America: Sam Wilson#5) - Boomslang was present when Viper (Dixon) monologued to Captain America (Wilson) about how Wilson was destroying America and Serpent Solutions' businesses. Viper ended the monologue by shoving Cap, who had been paralyzed by Asp and was bound to a chair, out a window. He was saved from certain death by the new Falcon (Torres), who was then confronted by Serpent Solutions, including Boomslang. (Captain America: Steve Rogers#13) - Boomslang was present when Baron Zemo asked Serpent Solutions to join his Army of Evil. Comments: Created by Mark Gruenwald (writer), Kieron Dwyer (penciler), Al Milgrom (inker), Ralph Macchio (editor). Boomslang's real name was revealed in the Official Handbook of the Marvel Universe A-Z, vol.10. Tone-Def and his fellow gang members were surprised when Boomslang ran past their hideout; they opened fire on the serpent. Captain America defeated the gang and got Boomslang medical care.